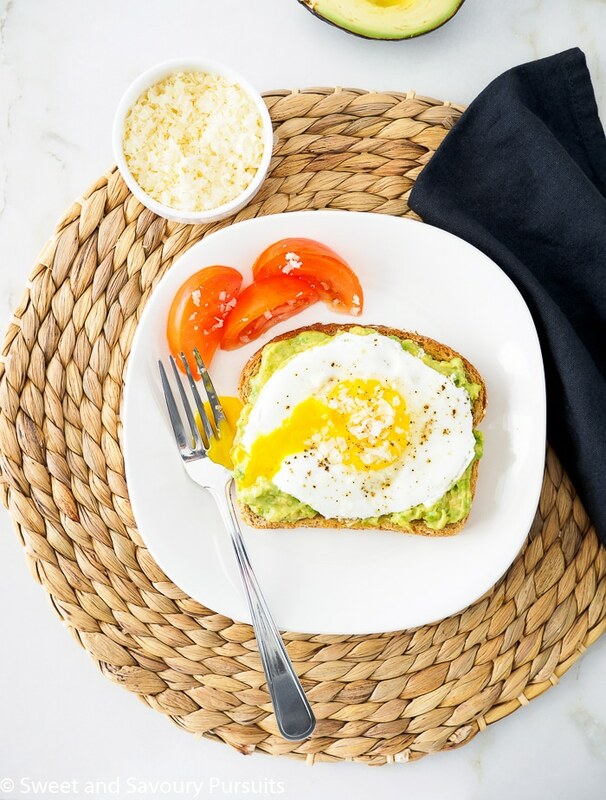 Fried egg on avocado toast is a delicious, quick, easy and no fuss meal that can be had for breakfast, lunch and even dinner. 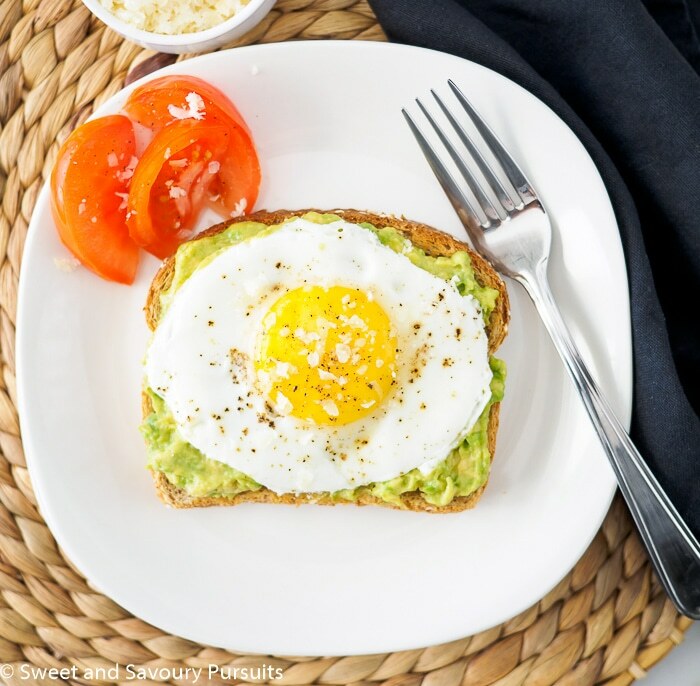 If you spend any time on Pinterest looking at all of the food images then you may have noticed that avocado toast, in all its variations, is all the rage at the moment. So when I recently found a perfectly ripe avocado on my counter, I proceeded to make myself my first fried egg on avocado toast. One bite and I understood what the fuss was all about. The sunny-side up egg, still soft and runny (my favourite way to have eggs) placed on top of creamy avocado on toasted bread is so much more delicious than I could have imagined, so much so that I now find myself craving fried egg on avocado toast. It’s so quick and easy, and such a satisfying and filling meal that I could easily eat it for breakfast, lunch and even dinner. 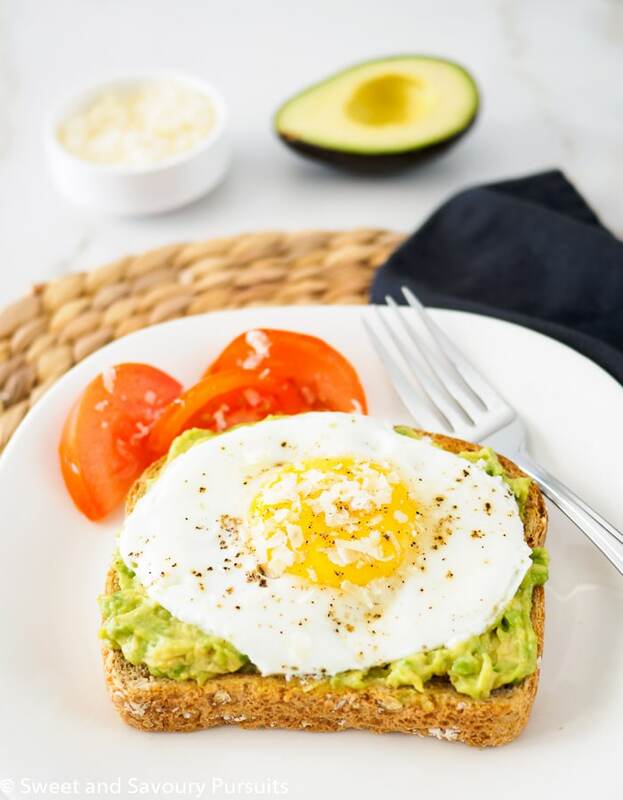 You hardly need a recipe for this 5 minute meal, all that is needed is for you to toast a slice of bread, mash up half an avocado, season it with a bit of salt and pepper and fry up an egg (done to your liking). Spread the avocado on the toast and top it with the fried egg. And that’s it, you’re done, now all you have to do is eat and enjoy this healthy meal. I sprinkled a bit of Parmesan cheese on mine but that’s completely optional. You could also add a little Tabasco sauce to the egg or to the mashed avocado, either way you can’t go wrong. Best of all, you could be eating a healthy meal in 5 minutes from start to finish. Enjoy! Toast the slice of bread and spread with the mashed avocado. Fry an egg (done to your liking) in a non stick skillet in a little butter or oil. Place fried egg on the avocado toast. Great idea! Love the pics. Thanks so much, hope you give it a try, it’s addictive! I’ve been eating more avocados lately, so I’m going to have to try this! Honestly, I wasn’t expecting to enjoy the combination of egg and avocado all that much, but it’s so good I’m eating this regularly now! Yum, I love avocado toast, and putting an egg on top just makes it more substantial and nutritious. Thanks for the great idea, Fida! Thanks Louise, have a great weekend! This is probably my favourite thing ever for breakfast: eggs and avocado. I’ve been doing it forever. Good job with this suggestion! Wish I would have know how good it is, though at the rate that I’ve been eating this lately, I think I will make up for it quickly! Best breakfast ever! I love this! And your gorgeously running egg is JUST the way I think it. Delicious! Thanks Jess, runny eggs are the best, I don’t think I would bother eating eggs if it wasn’t for the yolk!